Are you ready to excel at job interviewing? This guest article by Michael Kelsey offers some great pointers to help you change your perspective about interviewing. Follow his advice, and you'll not only survive the interview, you might ace it! Currently, for my day job, I work on contract to develop software. Most of my contracts run months, not years so I have ample opportunity to go in to a company and interview for a position. In addition, I am asked on occasion to take part in an interview to help a client determine if a prospective developer would be a good fit for the organization. So having sat on both sides of the table, with a frequency higher than most, I was asked by a client to come up with a short list of tips for interviewing. This short list of five tips will help you get an edge in your interview. This is the one tip that will influence all the others. What is an interview? Inter- as in intersection, interruption, and even Internet. The prefix inter means among or between. There is a bidirectional component. An intersection is where two roads cross, an interruption is where two thoughts cross, the Internet is where our collective networks cross. And an interview is where our views of each other cross. Many people lose this perspective when interviewing. I think I'm going into an examination and being judged on whether I'm good enough to get the job. This is only partially true. The other half of the event is that I'm "viewing" them. I am deciding if this is a place I want to work and I can contribute with my talents and time to be a happy and productive partner. So I'm going to be viewing very closely this hiring manager, the surroundings, the technical interviewer, the process they use, the tests they may give - everything I can to help me determine if this place is for me. I'm going to kick the tires. I'm not a lab rat in this process, I'm a participant in an inter-view. The last time you bought a car, did you just pull up at a dealer, walk around the lot and point at a car as the salesmen came running out to help you and just say, "I'll take that one over there in the corner?" Of course not. You probably looked at models, prices, fuel efficiency, comfort and amenities, horsepower, and safety features, oh don't forget the color, and maybe even more. Knowing that I am making a decision about my potential hire, I don't want to go in unprepared. What am I looking for? Does this company do meaningful work? Will I be doing something that interests me? Or am I just looking to get a paycheck and hoping nobody notices me. I need to take a little time to decide what I'm looking for and actually ask about the situation and environment I'd be in. For example, I've been put in places where contractors share a cubicle. It's a tight place to begin with, and I'd want to know who my bunk mate is before such a voyage. I've been at places where I worked in a meeting room with 6 other developers shoulder to shoulder around a big table with laptops. It's always fun when somebody takes a phone call, because we all get to listen in! I've even sat at a small table in the copy room where the faxes practically floated down onto my keyboard. At one place I came to work and didn't have a computer or even a chair, I sat on my desk for the first week reading manuals. And at another place I was given a box with my desk ready to assemble. We spent two days with electric drills assembling our desks before we could start working! If I wanted that, I would've been a handyman (which I'm not!). If I'm going to work somewhere - even for a few months - I want to see where I will be sitting. What's important to you? The location, some of the other people? If you get a chance, stop and ask a future colleague what they think, how they're liking it. Don't expect the whole truth, but if you listen, you can get enough of a clue. So be prepared for your interview with some questions and an idea of what you are looking for. I'm always surprised how nervous people get in interviews. I guess I shouldn't be, I get fairly nervous myself. And as a person who often suffers from sweaty palms, that first handshake can really make me on edge. But a chuck to the shoulder or a parade float style wave just aren't acceptable, and a friendly hug is right out of the question! So just get used to the fact that you are going to be some degree of nervous. If you are going to excel at job interviewing, you have to set aside the fears. But again - this is an interview. Stop and look at your interviewer, they're a little nervous themselves. They come in and shuffle through your resume. They have a stack of 50 on their desk and they have to talk to you like they know a little about you, that's stressful. They are usually meeting with you because they have a position they need filled. They have a need and it's not currently being met, this is stressful. They probably needed to fill this spot weeks ago and it got to the point where they had to get going on this, time is of the essence and stress is piling up. So, understand and accept that you will be nervous, but it's not too hard to see the signs from your co-interviewers, that they are nervous as well. This can be a great comfort knowing that you're all in this together. As I've said, you are viewing them, so they are giving you a first impression. You need to pay attention and get the full benefit of what they have to offer. But you are also making your first impression and you should take some time to put your best foot forward. They say, "You never get a second chance to make a first impression." But often we don't know when we are going to have that first encounter. You bump into a friend while out running errands and they introduce you to their friend who they've "told all about you." There you are - BOOM - a first impression, hope you were ready! 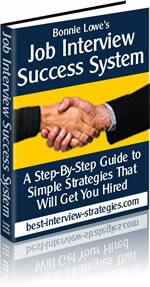 Interviews are very convenient in that you know you are going there to make a first impression. So make it count. Look your best, be confident, be excited for the new possibilities this opportunity may present to you - this day could change your life! You can excel at job interviewing by being at your best! For me moving from no paycheck to having a paycheck is a major difference that impacts my whole family. So I need to take advantage and get on edge and use the fact that this is my first impression for all it's worth. Job Interviewing Tip #5 - It's a numbers game. Shake it off. It is a very rare thing, in fact in my mind it's a flat out impossibility that this is theonly opportunity you're ever going to get. Interviewing is a process. If one doesn't go well, call it a practice and review it to see what can be improved. Consider it a benchmark to grow from. I went to an interview where one of the interviewers was a co-worker from a previous contract. He told me about the job and I thought it would be a very easy interview. I thought it went well and at the end of it they sent the guy I knew in to give me the "bad news." I was over qualified! They were afraid that I'd take their position just to have something to do while I looked for a better opportunity!! I was stunned. I needed some work, I was a little too desperate. What did I learn from that? I started to take a look at this as an inter-view. What were they saying about their company with a response like that? Their work wasn't interesting enough to hold my attention? Were they afraid of high turnover because there was a bad environment there? This turned out to be the case as I later learned when my pal left there and went someplace else himself. I was so bummed out for nothing and I got another job a few weeks later that was for a very long stretch and taught me a lot of great lessons and technologies. I sure am glad I didn't get that first one! The biggest thing you can do is learn from your experiences. If you hate to interview, realize that you're not alone. Go through with it, and see how much information you can soak out of the process. You can learn a lot about companies you might work for, but if you pay a little more attention - you can even learn some pretty insightful things about yourself.